Caley Thistle boss John Robertson. 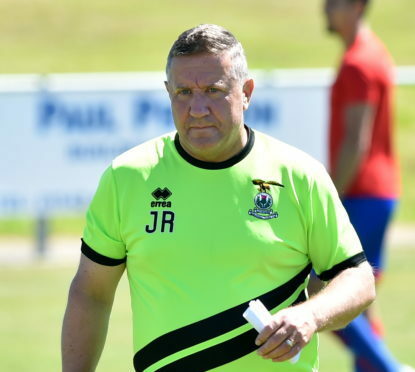 Caley Thistle manager John Robertson insists a victory over Alloa Athletic today will leave him satisfied with his side’s start to the Championship campaign. Inverness have taken four points from their opening two fixtures so far, with their opening day triumph at Falkirk followed by a 0-0 draw at home to 10-man Ayr United a fortnight ago. Although Caley Jags have been eliminated from both cup competitions they have entered so far, Robertson feels his side has laid decent foundations for the season. He said: “It has been a solid start. Looking at the first four matches of the League Cup, we won the first three and had a daft five-minute spell against Hearts that cost us. The rest of that game wasn’t that bad, but that’s what happens when you play against good teams. “Looking at the start they have made in the Premiership it puts that result into perspective. Our league form has been fine. We got a good win at Falkirk and should have beaten Ayr at home, but we didn’t take our chances. “The next aspect of it was we gave a lot of players who haven’t been playing an opportunity to stake a claim against Dunfermline in the IRN-BRU Cup, but they didn’t take it.